Extraordinary things unfold in Stirring the Dust. A corpse left unburied for fear of infection; a paranormal great-great aunt; bigamous and incestuous marriages; a runaway wife and her gypsy rover. Dramatic episodes in the past are linked with the present. A sense of something missing in events now has its echo in the rich cast of characters standing behind down the generations. Mary McCabe should know the cast in this drama. They are the author’s own family. Her mother’s side (the Gardens) were artisans from Banffshire. 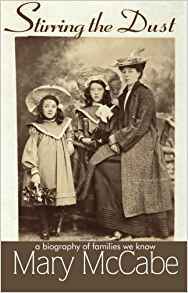 Her father’s lineage (the Morrows) came to the Central Belt of Scotland from Argyll at the time of Highland Clearances and worked in ironstone mining for three generations until the early twentieth century.